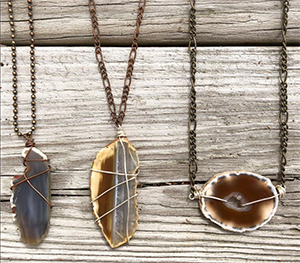 Ecru+stone is a jewelry and handbag company based in Columbus. Cbus Chic: What is ecru+stone? Lauren Gardner, Founder, ecru+stone: Ecru+stone is a small, Columbus-based jewelry and handbag company that strives to show God’s love through spiritual gifts of creativity and craftsmanship. I really want women to know that they’re loved and accepted exactly as they are. I want my jewelry to showcase each woman’s personality and style. My jewelry is simply an extension of what is already created within each woman. Gardner: I love designing and creating jewelry; using earthy, natural materials such as various types of stones, metal, leather and suede. The women in my family are very creative. After hearing many stories from my mom, she mentioned that my great-grandma, who came to America from Puerto Rico, Cecelia Stone, was a very creative and artsy woman. Cbus Chic: Who’s behind ecru+stone? Gardner: Since it’s such a small company, I’m not putting much time into it right now, it’s just myself who does everything. But I first fell in love with making jewelry when I was 15 and was hired on at a local bead store in Gahanna, Ohio. At that store, they sold every type of jewelry item possible and more it seemed. Plus, they had classes that women could take and learn how to do certain techniques such as making clay beads, how to peyote stitch seed beads, and how to pearl knot. I loved the feeling of community. A place to go and bring out the creativity stirring around in your head. And to see each person’s process and ultimately the end result. Bead stores are very rare to find these days in central Ohio, and I want to bring back that sense of community through ecru+stone. Cbus Chic: What types of items do you sell? Gardner: With my jewelry, a couple techniques I really like to use are wire-wrapping and pearl knotting. I like to wire-wrap individual beads together and well as wrap wire around different gemstones and geodes. With pearl knotting, as you can imagine a vintage pearl necklace, the pearls are strung onto a certain type of string, and between each pearl is a knot to keep the pearls separated. I like to use this technique with not only natural-cut pearls but with Swarovski bi-cone crystals and other small beads, especially if it’s a multi-strand necklace to give some texture and interest. I also make some handbags which I design and sew myself. I really like to try different techniques when I make handbags, really make it a piece of artwork. Fabric dying I love to do. Tie-dyeing, Shibori dyeing, and dip dyeing with natural dyes I would like to get into more. I like to use hand-sewn elements in handbags, small details really count. Shows that I labored with love because I love the process and finding new techniques. 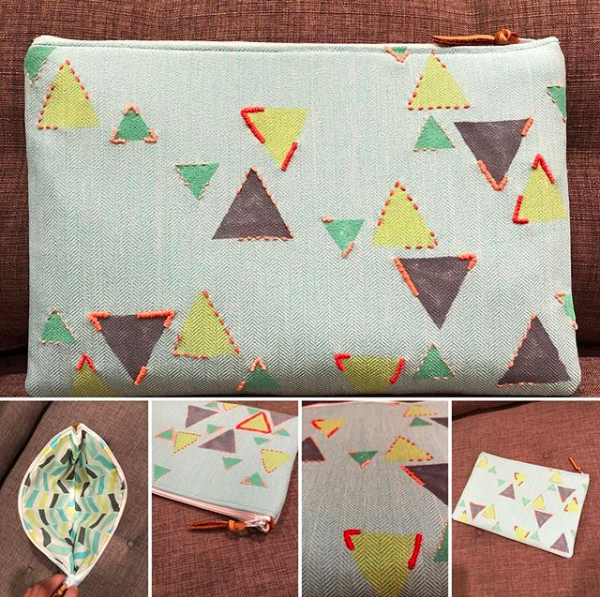 I’ve started to get into punch needling, so I would like to make some fun designs for new handbags. I wouldn’t say there’s a specific overall look to my handbags, just techniques that I fall in love with and try it out. Cbus Chic: Can you give us price points for your items? Gardner: For my jewelry and handbags, the price point can range from $50 – $300 depending on the simplicity/complexity and materials used as well as time invested. Cbus Chic: What are some of your best sellers? Gardner: The more unique pieces definitely get the most likes. And I find that people tend to go for the handbags over the jewelry. Cbus Chic: What makes ecru+stone unique? Gardner: Ecru+stone is unique because there’s not just one look. I like to find what’s different out in the world and what really speaks to me. So my pieces show my personality and what interests me as the trends come along. Gardner: Eventually I want to create enough inventory and start going to flea markets and local vendor shows. Gardner: You can follow me on Instagram, it’s what I’ve done so far!